Leonard the Lyrebird: World Premiere | Your Music Inc. 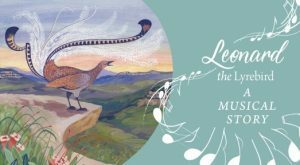 If you are looking for a wonderful musical family experience among animals and nature, this new Australian work by Ian Munro – Leonard the Lyrebird: A Musical Story is definitely for you! Based on the children’s book by Jodie McLeod and Eloise Short, this new work will be performed in the rainforest of the Jamison Valley at Scenic World Blue Mountains, by our own Sensory Concerts musicians Grace Kim (piano, artistic director) Philip Green (clarinet) and Teije Hylkema (cello), and with the composer narrating. This will be an unforgettable multi-sensory experience! Ticket Prices: $29.25 – Adults, Children $18.90 (4yrs -13yrs), Kids under 4 – Free. NOTE: All tickets include unlimited access to the Scenic World Blue Mountains Walkway, Cableway, Skyway and Railway.